The pressure for B2B marketers is on. Modern B2B buyers have an increasing tendency to research purchasing decisions online long before they engage with Sales. Customers are empowered with information. Winning over modern B2B buyers requires organizations to revolutionize their marketing approach, and the barriers to success are vast. Facing great scrutiny, we must act on the buyer’s terms, tie all activities into revenue, and continually optimize performance. Overall success will depend on our ability to influence change throughout organizational levels, and build strategies for buyer-centric lead generation and funnel optimization. The B2B Marketing Benchmark Report will examine the top challenges B2B marketers are facing, the barriers that exist in preventing success, and best practices in overcoming them to attract and convert the modern B2B buyer. 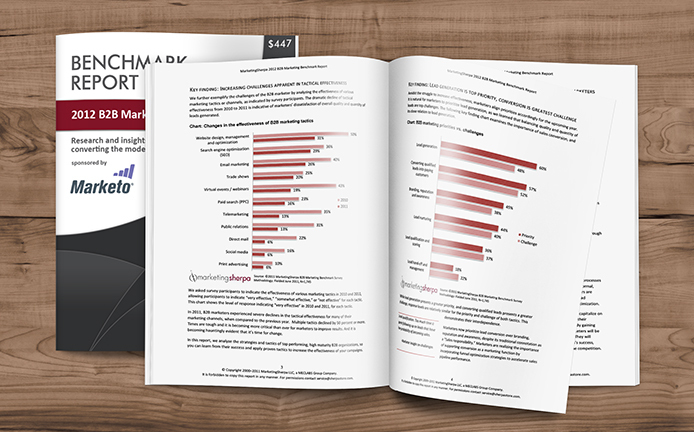 To get the B2B Marketing Benchmark Report right now, simply fill out the form to the right, and we’ll send you an email with a link to instantly download your copy.